The Cumbria Coastal Way is a continuous long distance path, approximately 185 miles in length, following the Cumbria coast from Silverdale on Morecambe Bay at the southern boundary of Cumbria, to the estuary of the River Esk marking the boundary between England and Scotland. Along the way you will trace the coastline of the southern Cumbrian peninsulas with their vast stretches of estuarine sands, pass through the stunning Lake District National Park and the industrial heritage of its west coast, walk along the quiet reaches of the Solway Firth and through rough border country with glimpses of Hadrian's Wall and along the River Eden through the historic city of Carlisle and on to the Esk and beyond to finish in the famous border town of Gretna in Scotland. Single rooms are available. We only apply a supplement for single accommodation when there is a direct cost to us and we cap this in line with our ‘Fair pricing’ policy. Solo walkers pay a supplement of £10 per walking day, plus any single room supplement which may be required. This is our recommended option for the Cumbria Coastal Way splitting the walk into 13 stages. This itinerary enables the whole walk to be comfortably completed within a fortnight. Most days are around 14 or 15 miles with a couple of longer days of around 17 miles. Arrive Siverdale and check in. If you have three extra days, this option, walking the Cumbria Coastal Way over 16 stages, allows a more leisurely approach to a superb long distance path. 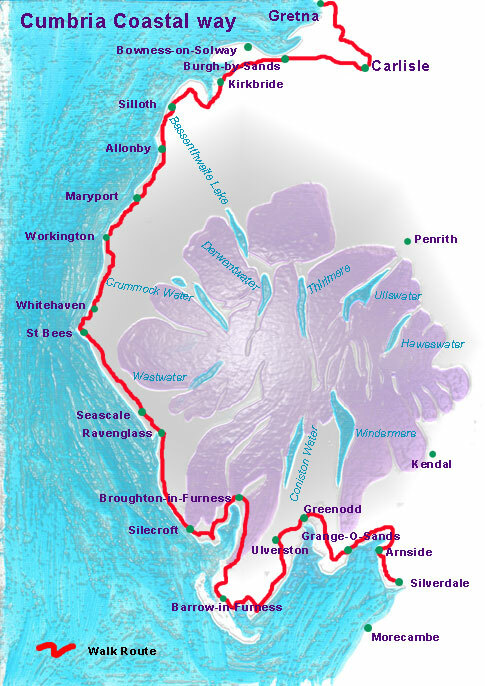 Walking the Cumbria Coastal Way over 16 days means that no stage is more than 15 miles and most are less than 14 miles. This section on the southern Cumbrian coast takes you from Silverdale on Morecambe Bay to Ravenglass on the Lake District West Coast. The final section of the Cumbria Coastal Way crosses St Bees Head and follows the Solway and Eden to Carlisle before completing the Way with a crossing of the Esk into Scotland. Arrive Ravenglass and check in. SILVERDALE: There are regular trains to Siverdale (14 minutes) from Lancaster which is on the main North-West rail link between London and Glasgow. RETURN: Carlisle is on the main North-West rail link between London and Glasgow. RAVENGLASS: If you intend to walk the Cumbria Coastal Way in two sections with a split at Ravenglass, this town on the west coast has a limited rail service connecting it to the main North-West rail link either north via Carlisle or south via Barrow and Lancaster. Note that there is no Sunday service. 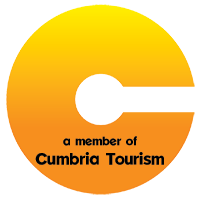 The Cumbria Coastal Way has no big ascents or high peaks and is suitable for all ages and abilities. The Way has been created by linking existing footpaths and rights of way and in some sections through the negotiation of new footpaths. This is a good introduction to long distance path walking and although the route may not be quite as well way marked as the National Trails, it does have a reasonable level of signage and the excellent Cicerone guidebook which we provide should make navigation a straightforward affair. The Cumbria Coastal Way can be relatively easily completed within 2 weeks or in two seperate sections, breaking at Ravenglass where there is a rail connection.